Looking for a quick, easy and flexible way to earn money in Spain? Then working in English camps could be the answer. 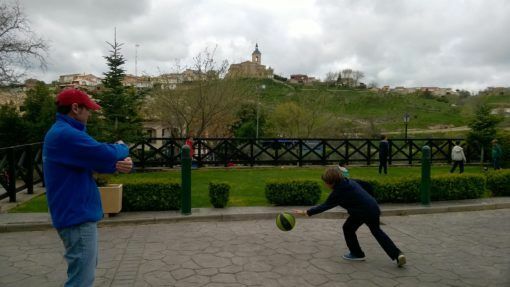 In April and May this year Andrew and I signed up to work in English language immersion camps just outside of Madrid; here’s the lowdown on what our experience was like, how we found our jobs and how much money we earned. Although Andrew and I arrived in Spain with the intention of living and teaching in Madrid for a year, we struggled to find an affordable apartment in the capital and ultimately decided that long-term Spanish life wasn’t for us. However, before moving on to travel in Eastern Europe and then return to Asia, we needed to make some cash quickly – that’s how we ended up accepting jobs at English camps in Spain. 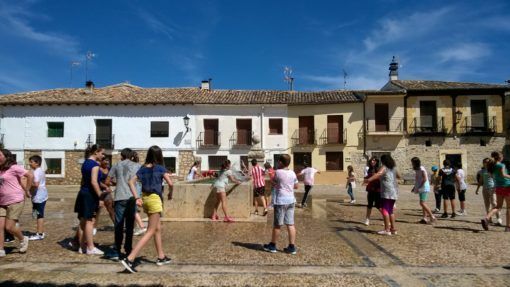 Right now in Spain there’s a huge emphasis on learning English, so many parents are signing their kids up for extra-curricular English summer camps or language immersion programmes. These generally take place after school finishes in July and August, but schools also send students on camp trips throughout the academic year. Forenex – one of the most established companies in Spain which runs residential camps throughout the country. Enforex – has been going since 1989 and runs summer camps in Barcelona, Madrid, Seville, Granada, Valencia, Marbella and Salamanca. TECS – operates in Andalucia and has a good reputation for summer camps. Nexolang – run English camps in and around Madrid throughout the school year and in the summer. To apply for jobs in camps you’ll need to be a native English speaker or have a high level of English as well as some previous experience working with kids; a degree and TEFL qualification also helps. To legally work in Spain you need to apply for an NIE (Foreigner Registration Number) and get a Social Security number. If you’re looking for longer-term teaching jobs in Spain, check out our detailed guide about how to teach English in Spain. You can find out more about teaching in other parts of the world on our teaching English abroad page. We were approached by Nexolang after I posted a general advert offering my services as an English tutor on the Tus Clases Particulares website. After short interviews we both signed up to work at English camps in Fuentelencina, a small village about an hour away from Madrid, throughout April and May. Camps were between three and five days long and all of our accommodation and food was free, as well as transport to and from the camps. 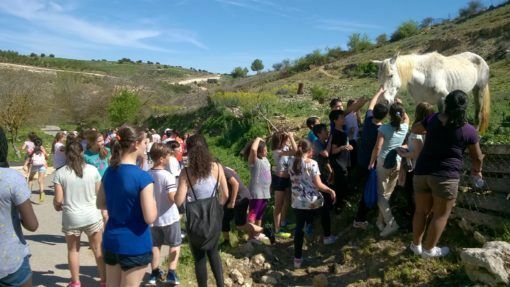 We worked with groups of school children aged between 7 and 12 in a rural residential camp with up to five other teachers and a camp co-ordinator. Each teacher was assigned a class of between 11 and 14 students but we often worked together with all 50 to 60 children on whole-group activities. 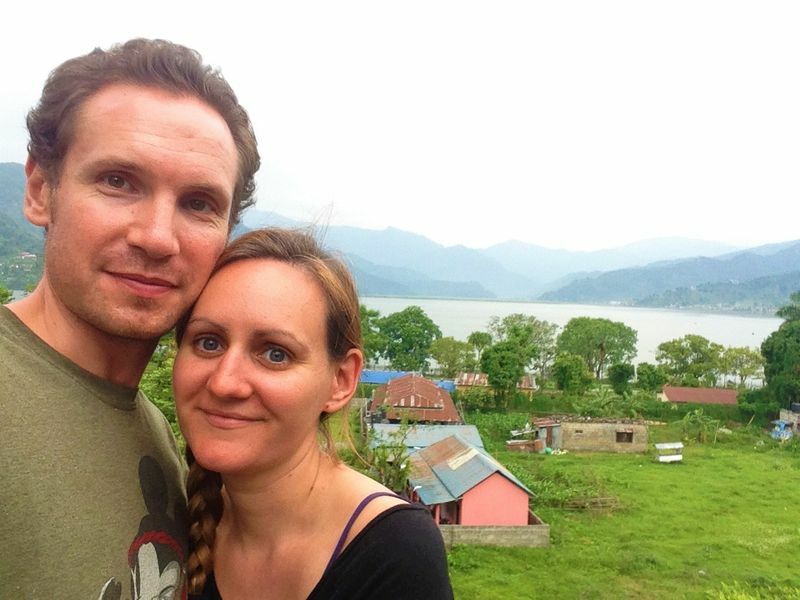 Andrew and I were able to share a private en-suite room while the kids slept in cabins or dormitories but we ate all of our meals together in the onsite restaurant. We had access to classrooms, a sports pitch and playground as well as a TV room for evening activities. As the camps were language immersions, children had to sign a contract to say that they’d speak as much English as possible. We weren’t allowed to talk to the children or each other in Spanish and the class teachers who had accompanied the kids from school had to do the same. 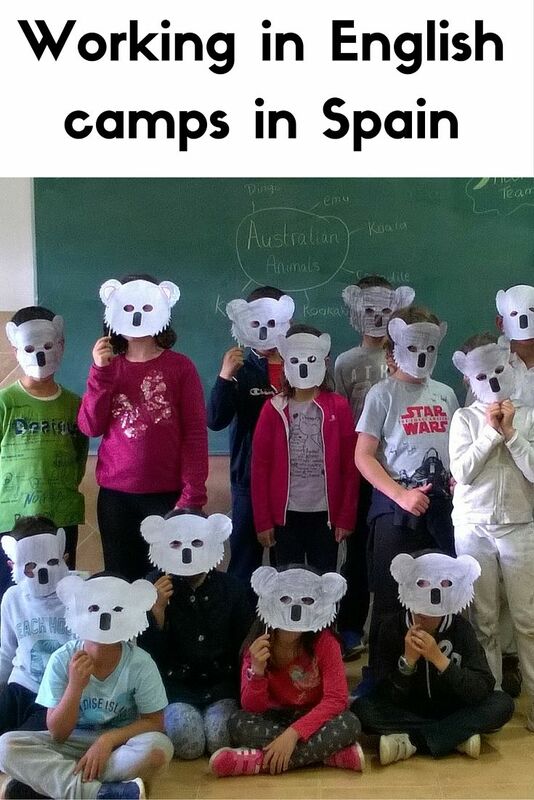 The camps were themed around different English-speaking countries; we had a British sports week for example and an Australian camp with activities like koala-mask making. 8.30 – 9.00am: Wake the kids. For the older groups we only needed to knock on their doors but the younger kids needed more prompting and help with brushing their hair or tying laces. 9.00 – 10am: Breakfast. Meals were eaten communally on long Hogwarts-style tables in the restaurant. We had to help the children with their food trays, seat them, pour their milk in the mornings, make sure they ate a good portion of their food and cleared their trays afterwards. 10.00 – 11.30am: Activities or sports. We’d usually spend about an hour on classroom-based craft activities like paining a London underground sign, making flags, masks or collages. We split the kids into teams to play sports like football, basketball, hockey, softball and badminton. 11.30-12.00: Break. After handing out the drinks and snacks for the kids we’d try and sneak in a cup of tea and sit down for five minutes. 12.00 – 13.30: Activities or sports. Other activities included choreographing our own Haka dance, holding a scavenger hunt, Olympic games and taking excursions into the small nearby village. 13.30 – 15.30: Lunch. Once all the kids had finished eating we had to make sure they brushed their teeth and were out in the playground before we could escape to our rooms for a rest. 18.30-20.00: Movie/classroom activity. On the first evening the children all watched a movie in the TV room, on the second we had to take them back to the classroom for another activity, which was hard-going as by that point in the day the kids just wanted to relax. 20.00-21:00: Shower time. Teachers had to supervise shower time, making sure that all the kids had one. Sometimes we were able to take turns with the other teachers to go and shower ourselves. 21:00-22.00: Dinner. I’ve never gotten used to having dinner so late in Spain and found eating at this time a bit of a struggle. 22.00-23:00/23:30: Treasure hunt/disco. The last exhausting hour and a half was spent chasing our groups around in the dark on a treasure hunt and dancing away at a disco on the last night. 23:00 – 23:30/midnight: Put the kids to bed. The kids were usually hyped up and it was a struggle getting them to bed. Once lights were finally out we’d have to return to the TV room to clean up and have a meeting about the following day’s itinerary before we could go to bed ourselves. Pros – the children were generally very excited about being on holiday so they were enthusiastic and fun to be around and we only experienced minor behavioural problems. The work itself wasn’t particularly challenging as we were just supervising play and sport activities. All of our resources, timetables and lesson outlines were provided for us so we didn’t have to do any planning. Our accommodation, food and transport to and from the camps was free so we didn’t spend any money while we were working at the camps. 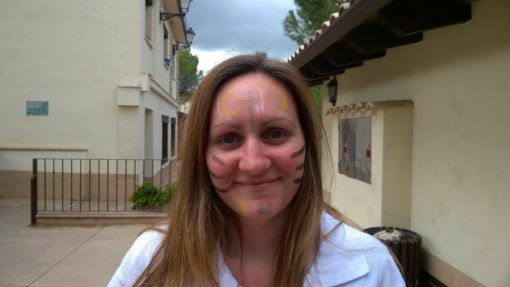 I also enjoyed meeting other teachers and experiencing a slice of rural Spanish life. Cons – the days were very long and physically exhausting and we had very little time to ourselves. Even when we did have a break it was hard to get any real distance from the job as we were stuck in the camp with nowhere else to go, surrounded by children. The hours were made longer by the fact that we had to get to camp the night before the children arrived and on one occasion the school were late leaving so we didn’t get home to Toledo until around 8pm on the Friday. Depending on who the camp co-ordinator was, there could be some disorganisation and confusion over the timetable and rules; with larger groups we had to share classrooms and sometimes resources ran low. One of the biggest cons for me was the food. I may be a fussy eater, but Andrew agrees that the camp food was pretty awful. We were served an unhealthy breakfast of cake and hot chocolate and huge helpings of greasy, oily food at lunch and dinner; salads were drowned in oil, everything was saturated in garlic and the meat (which I thankfully didn’t have to eat) was particularly disgusting. How much can you Earn by Working in English camps in Spain? So, how much did we earn from working at English immersion camps? We were paid a flat daily rate of €80 (£60), after tax and social security was deducted we were left with €73 (£57.80). On our longest day of camp, which I’ve described above, this breaks down to just €5-€6 (£4-5) per hour, but this is balanced out by the shorter hours on the first day when the kids wouldn’t arrive until 10 or 11am and the final day when they left at around 3pm. It’s worth noting that teaching wages are generally pretty low in Spain, especially when compared to those in Asia; in Vietnam we earned $22/23 per hour (£15-16). When we were applying for jobs in Madrid we were offered between €8 and €15 (£6-12) per hour to teach in schools and academies. Although the camp pay was lower than we’re used to, we found that the flexibility and short-term nature of the work made up for that and it was a simple way to earn some extra cash quickly before moving on to Eastern Europe. If you need help finding a teaching job in Spain or anywhere else in the world, it can be easier to go through a specialised recruitment agency like ESLstarter. They can help you navigate the whole process from submitting your CV to accepting a role. Have you ever worked in an English camp or would you ever consider it? Do you have any questions or advice about working in English camps? Let us know in the comments below. When I taught 6th grade every school year we spent a week at science camp. The first couple of years were fun and then, truthfully, it became more a chore than anything else depending on the group of kids I had and/or which schools we were housed with. It was good to get out of the classroom for a week though but it also meant being away from my family for the week. Long way of saying, I can’t imagine working at a camp for two months, I have such a picture in my head of what that would be like. Kudos to you both for taking it on! Another experience to learn from and you’re on your way! Very long days and kids can be exhausting, but sounds like they were quite well behaved?…. Financialy not great, but at least you get food and accommodation. Although I guess you still paid for the apartment in Toledo? Great experience in any case, did you improve your Spanish after these few months in Spain? Hi a teacher with questions for you. [email protected]. Thank you. Hi Chris, we’ve emailed you. I’ve not worked in an Engliah camp but I have worked in a summer camp for children. It was a lot of fun but utterly exhausting. And they were young teenagers from Leicester and Newcastle too…..! Sounds tough – I prefer to stay away from the teens and stick to the younger kids 🙂 We had a good experience but I’m not sure I’d repeat it again when the wages were so low and the hours so long! You were lucky not to get that position at Talking Point… The school is going down the tubes apparently. They’ve had an exodus of practically all of their senior staff over the past few years, and the management seems inept. It’s a shame you didn’t find anywhere you loved and a salary you could comfortably live on in Madrid. We spent 5 years there, and it was a great experience. I came across your blog because we’re currently in the process of relocating to Vietnam, and found your information really helpful. Hi, thanks for reading and commenting, I’m glad you found our blog useful. It definitely sounds like we dodged a bullet then with Talking Point! I’m glad to hear you had a good experience in Spain and I hope you enjoy Vietnam. 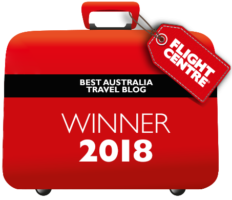 Are you heading to Hanoi? If you are and are still looking for a job, let me know and I can see if our old language centre is still looking for teachers. 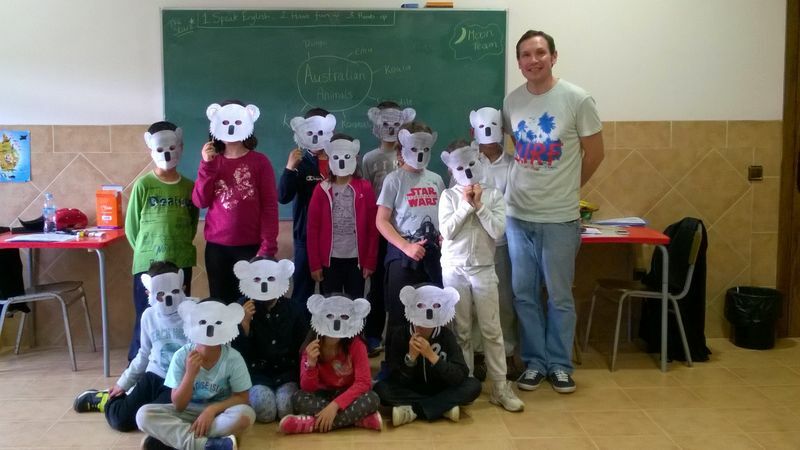 Teacher looking for summer camps in Europe. USA and EU citizen with experience. Where can I find resources? Thank you.